I am UP for a laugh, goodness me this couldn’t be truer these days. I am all about the comic relief. 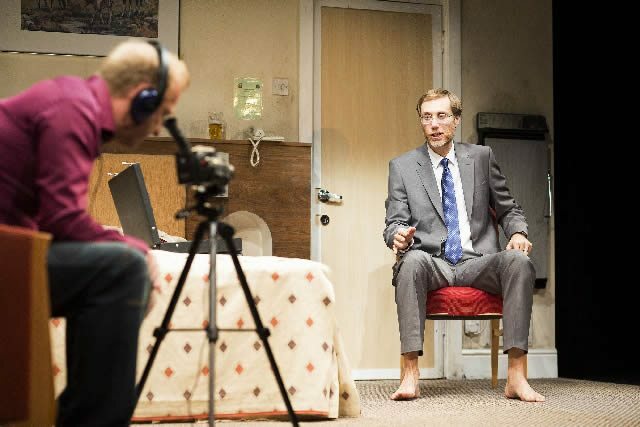 SO when faced with an opportunity to see The Mentalists, self-described as “a comedy by Richard Bean” starring Stephen Merchant and Steffan Rhodri, I was more than eager. Funny yes, but heavy too, The Mentalists is a strange piece of writing for Richard Bean to pull from his back catalogue and left me feeling somewhat morose rather than truly rib tickled. It is telling that Bean studied Social Psychology before making it as a writer; the show is about a deflated middle manager, Ted (Merchant), who wishes to form a cult of people who pride themselves on “cleanliness, good behaviours and sleeping with [their] own wife.” On inviting his friend, Morrie (Rhodri), to film his “inspiring” message to potential cult recruits, it is gradually revealed that Ted is suffering a somewhat homicidal nervous breakdown. Whilst the stage chemistry between Merchant and Rhodri was at times palpable, Act 1 drags a little as we watch Ted struggle in vain to get to the point. Act 2, however, is much faster paced and gripping, leading to Ted’s acceptance of his insanity – nicely performed by Merchant with the wide-eyed grin of a psychopath. Reflecting the shift in drama between Act 1 and Act 2, I found first-timer Merchant just about settled into his role after the interval. He was watchable and whimsical in the first half, but seemed a touch uncomfortable on stage. Whilst I do have high praise for director, Abbey Wright, she too is a relatively newcomer and has not yet directed for a West End stage and may not quite have been the right choice to direct a West End newbie. Or perhaps this was just not the right venue for the piece, which felt a little more intimate for a four tiered venue. Venue size and act pace aside, The Mentalists has some excellent one liners; I very much enjoyed the topical quip about the Greeks having “peaked early,” I also laughed heartily out loud as the “video” was played on the shoddy hotel T.V. It is clear, however, that this is one of Bean’s earlier and less refined works as it seems moments of comedy were not hugely developed. This production of The Mentalists is certainly worth a watch, especially to see Merchant and Rhodri in the flesh. However it suffers a touch from a vast performance space and perhaps could have used some further rehearsal to make the action truly flow comfortably on stage. Still, if you could find a £30-40 ticket, it is worth a punt.